Twinning in black, the duo looked adorable in the chrome setting of the restaurant with yellow flowers and a lit candle between them. 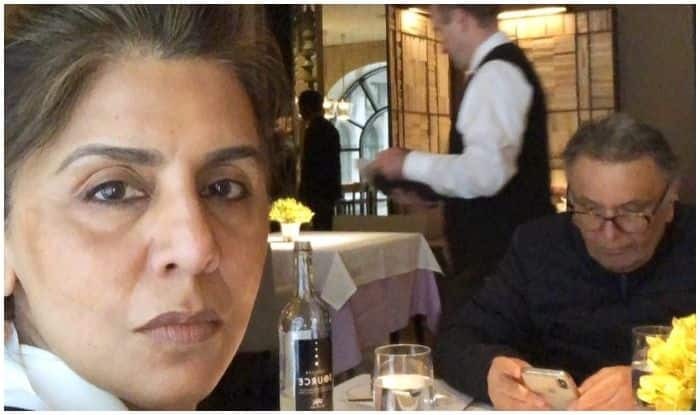 Couples who think lunch dates are romantic, need to rethink after marriage or so yesteryear actress Neetu Kapoor reveals in her latest Instagram upload with husband Rishi Kapoor. While out for a lunch date in New York, where Rishi has been undergoing treatment for a yet undisclosed disease, Neetu took to her social media and shared a very interesting picture, the caption of which is every married couple’s dilemma. Twinning in black, the duo looked adorable in the chrome setting of the restaurant with yellow flowers and a lit candle between them. In the picture which is a selfie taken by Neetu, Rishi is seen engrossed in his phone, least aware of her clicking the pic. Sharing the picture on Instagram, Neetu captioned it, “Lunch date this is what happens after 38 years of marriage husband on the phone and I’m clicking selfies” (sic). Earlier, Neetu had shared pictures from their New Year’s Eve celebrations in New York only and her cryptic caption made fans concerned about Rishi Kapoor’s health as she wrote, “Happy 2019 no resolutions only wishes this year !!! Less pollution traffic!! Hope in future cancer is only a zodiac sign !!! No hatred less poverty loads of love togetherness happiness n most imp. Good health” (sic). On the professional front, Rishi Kapoor had three releases last year – Umesh Shukla’s 102 Not Out, alongside megastar Amitabh Bachchan, Anubhav Sinha’s Mulk and Leena Yadav’s Rajma Chawal. His upcoming movie with actress Juhi Chawla has reportedly been put on hold indefinitely till the actor returns after his treatment.